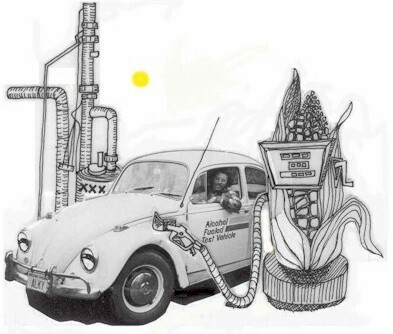 Ethanol is to Petrol (gasoline in USA) what biodiesel is to diesel with both Ethanol and Biodiesel being referred to as biofuels. Ethanol (an alcohol) is primarily made from corn grain starch. When added to petrol it reduces toxic emissions and increases the octane of the fuel and so it can be compressed more before it spontaneously ignites – a good thing. At present many filling stations in the UK have 5-10% ethanol in their petrol, so you are probably using ethanol without realising it. This is called E5 (5% ethanol 95% petrol) or E10 (10% ethanol 90% petrol). Tesco for example in conjunction with Greenenergy have been selling E5 petrol containing Brazilian sugar cane ethanol since 2005. An advantage of ethanol is that it can be extracted from crop waste giving two benefits. Firstly, the crop waste would not be burned as it would have been in the past, and secondly less fossil fuels would be used by cars. Similarly sugar cane can be grown specially for the ethanol it can generate since the carbon it releases when used in a car’s engine is carbon it adsorbed when it grew. Almost all contemporary cars can be run on E10 fuel without any modification. If higher concentrations of ethanol are to be used then modification is usually necessary – for example, ethanol is much more corrosive and abrasive than petrol. Therefore ethanol in fuel will clean old deposits from the fuel lines and fuel tank and gunge up the fuel filter. When a car is converted to run on ethanol it needs to have its fuel filter changed very soon afterwards. Once the old deposits are gone, then fuel filters will need changing as often as the did before. With some modification petrol cars can be converted to run on pure ethanol. Since water and carbon dioxide are the only byproducts of combustion, it is polution free. Also it is now possible to buy alcohol fuel enabled cars with fuel injection technology that measures the oxygenate content of the fuel used and adjusts the air/fuel mix appropriately. If your car is not factory read ethanol burning then modications need to be made to the fuel line, carburetor (increased jet diameter of 40%), and ignition system (advance the timing of the engine, and replace spark plugs), plus an alcohol tank needs to be added (rather than putting alcohol in the old petrol tank). It is of course also possible to convert other petrol powered vehicles to run on alcohol – for example, motorcycles, boats, farm machinery, and lawn mowers etc.